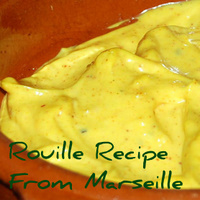 This rouille recipe was first tasted by us in a village restaurant near the Mediterranean city of Marseille. we were staying with a friend who has a house near Ventoux in Provence. It came served with a marmite of shellfish soup that David ordered.... it was creamy, spicey and absolutely delicious. We experimented with the recipe when we got back home and think that this quick and easy version of it is very close to the one we enjoyed in France. It goes well with bouillabaise or any seafood soup or stew. 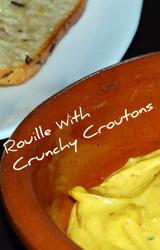 We serve it with our seafood bisque along with crunchy herby croutons. 1 level teaspoon of Pimenton - smoked paprika. Place all the ingredients into a mixing bowl and stir well until evenly combined. Pile into a small serving dish. Serve with your favourite fish soup, stew or fish recipe. Serve with our famous Seafood Bisque and crunchy croutons...or why not try it with our flavoursome Seafood Stew just to add a little more zing!